This Mediterranean Bruschetta Spread is incredibly healthy and versatile! Use it on cucumber slices, chicken, burgers, a baguette or with pita chips for a dose of Mediterranean flair! The other day, I whipped up some these really cute Mediterranean Cucumber Cups inspired by The Comfort of Cooking as a healthy holiday appetizer. They were SO delicious and the presentation was beautiful! I had doubled the recipe for the bruschetta mix, not quite knowing how much I was going to need for all of my cucumber slices. Well, it turns out that I ran out of cucumber (darn! 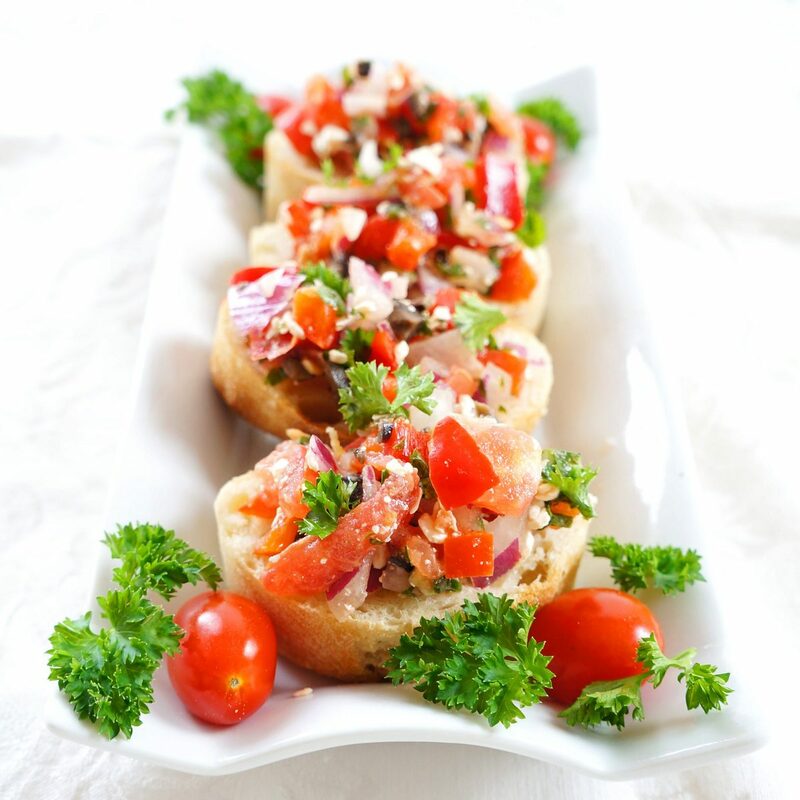 ), so then, suddenly I was stuck with an overwhelming amount of this bruschetta mix. So me, not wanting to waste any good food, started topping up EVERYTHING possible with this Mediterranean Bruchetta mix. 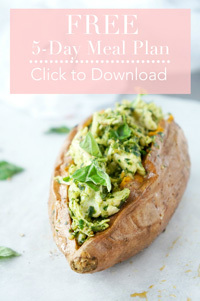 I put it on my salad for 4 days straight, baked chicken breasts (yum! ), burgers (double yum! ), and even decided to top up a leftover baguette with some of this mix. 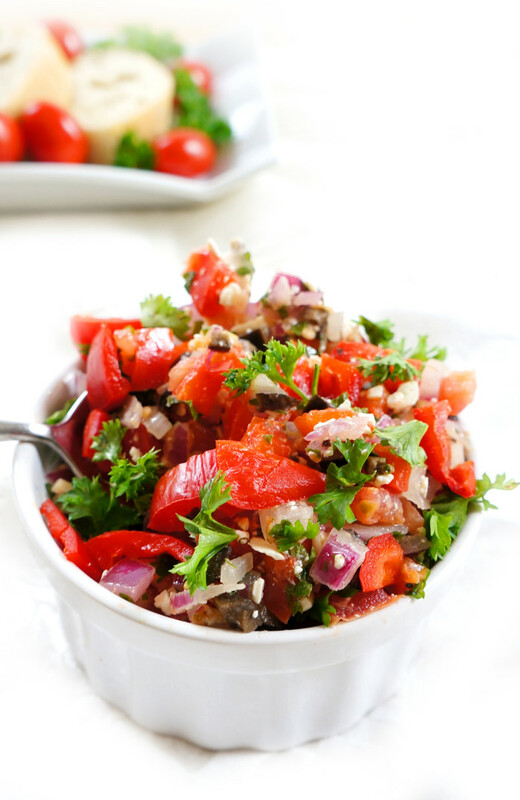 It would also be awesome with baked homemade pita chips! I could just go on and on with all of the different ways you could use this delicious spread. When I served it to my family, it was gone in 5 minutes TOPS. 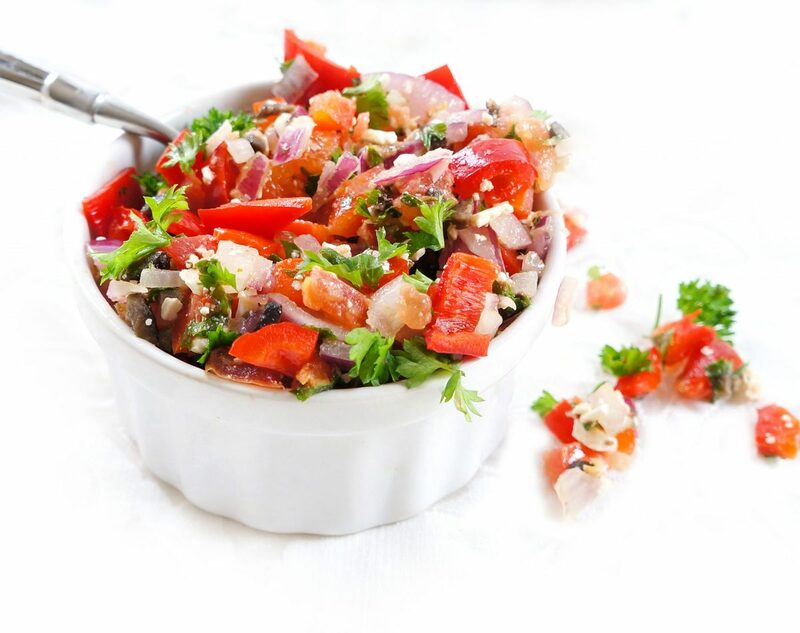 I love how this mix is filled with tons of healthy ingredients and Mediterranean flavours. My favourite type of food is Greek, which I’m sure you can tell with all the Greek flavours happening on my blog, like my favourite Spiralized Greek Cucumber Salad and Mediterranean Chickpea Salad. 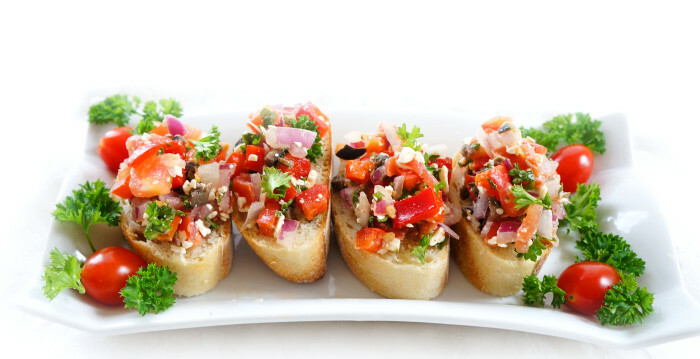 This bruschetta spread just provides one more way to incorporate a little Greek flair into lots of different dishes! What would you top up with this delicious Mediterranean spread? In a large mixing bowl, mix together all the ingredients. Season with salt and pepper, to taste. Serve on cucumber slices, chicken breasts, burgers, a baguette or with pita chips! Hi Melissa! You can keep it in the refrigerator for up to five days. I wouldn’t recommend any longer than that. Enjoy!